Keep your pet looking their best with our professional groomers. Your pet will enjoy the spa treatments they need with our talented groomers. Bring your pets in for day care and exercise. We're open every day. Our experienced staff will care for your pet and give them the socialization they need. Let your pet stay in luxurious comfort when you're away. Our dog suites and cat condos are a relaxing and comfortable place for your pet to vacation. $5 Off Your First Service! 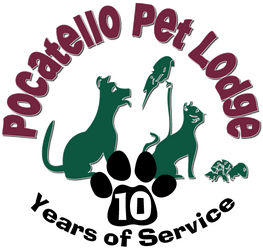 At Pocatello Pet Lodge, we treat your pets like the valued family members they are! My name is Stephanie Adams. I've been caring for animals for over 20 years, more than half of them have been in Pocatello. Read more of my story here. "We took our sweet new husky pup here to get a bath and his nails clipped! More than pleased with how sweet they were to him and everyone seemed so excited! They did such an amazing job and he smells so good!! We will definitely be bringing him here again! So happy! And did I mention the ADORABLE bandana after?!" "I send my girl once a week for daycare, and it is the best investment I have made in a long time. She comes home exhausted and happy and always has to chill for a few days after. It gives me a chance to catch my breath!! She's a very energetic girl. The staff are great, and I never have to worry about her. Thanks!!!!" "We left our two dogs and two cats here for three days and they had so much fun! A lot of the big chain kennels charge a fee for playtime and it was included here which is awesome! Plus they post pictures of playtime at the end of the day so you can see what your kiddos were up to. You just don't get that kind of service anywhere else! I would HIGHLY recommend!"